Making the decision to aerate your lake or pond is a good choice. However, inadequate aeration systems can cause many undesirable effects on your body of water. Many tests have shown that an undersized aeration system, improper placement of main components, or utilization of the wrong equipment have resulted in deteriorating water quality parameters. In fact, we have seen an increase in algae growth and acceleration of fish kills due to improper aeration. Once we have obtained the data, we will generate an air photo of the site or use a CAD drawing and lay out the recommended system which will include a breakdown of the equipment required and the expected roll rate (number of hours to completely turn over the body of water). We can also include an expected cost to operate the recommended system. 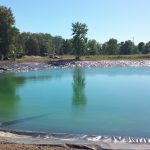 Wisconsin Lake & Pond Resource LLC will provide professional installation of the aeration system. We provide all services except electrical requirements. Since we are one of the only companies that have a designated service technician on staff, we guarantee your system will be installed correctly, professionally, and efficiently. 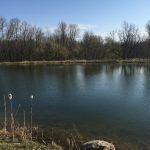 Go to our Aeration Project Gallery for a detailed look at many of the aeration systems Wisconsin Lake & Pond Resource LLC has designed, sold, and installed for our clients.